Plant-based restaurant Virtuous Pie, best known for its pizzas and ice cream, is expanding its menu to include a dozen small plates. The new additions feature many of the ingredients customers have come to know, love, and request, and will be available at all locations as of Wednesday, September 26, 2018. “Our primary offering has been and always will be pizza, but due to requests from our customers, we saw an opportunity to expand our menu and introduce new and exciting complimentary dishes,” says says Jim Vesal, Director of Culinary and Business Development. 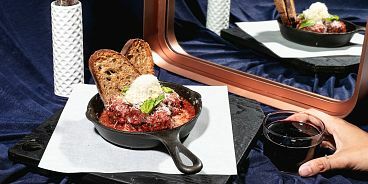 In addition to a number of new salads, the chain is adding: Cheese + Pate Board with sunflower seed and mushroom pate; Roasted Harissa Cauliflower with charred cauliflower and green harissa; Mac + Cheese with a creamy cashew sauce; Italian Meatballs in a smoky tomato sauce; Garlic Knots; Ricotta + Gem Tomatoes with creamy almond ricotta; and one new dessert item, Skillet Cookie, featuring a warm chocolate chip cookie, marshmallow, choice of ice cream, and salted caramel sauce. The new items are priced between $5 – $11, providing an even wider selection of menu items at an approachable price point. Most of the additions are also designed to be shared, family-style. 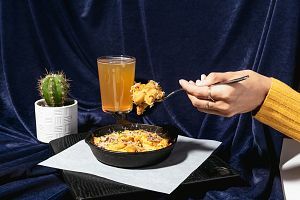 “We wanted these items to be a little bit more Italian-inspired than the rest of our menu as we really wanted to show you could do amazing plant-based versions of the classics. We started by looking at some of our favorite dishes and veganized them. 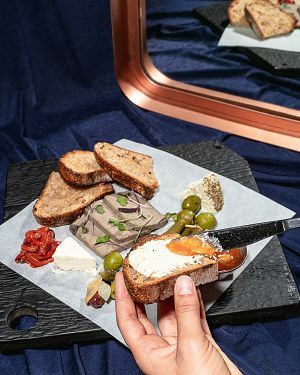 It’s also an opportunity to showcase some of our non-dairy cheeses a bit more, so expect to see some great dishes using them as a primary component,” says Vesal. The small plates come on the heels of the restaurant’s retail cheese program which launched in August. Select nut and tofu-based cheeses are available for purchase at Virtuous Pie’s Wesbrook Village location near UBC, every Friday to Sunday, while quantities last. Orders can be placed online or over the phone. Restaurant expansion plans are also continuing, with the College Street location in Toronto scheduled to open November 2018, and a fourth, soon-to-be-announced Canadian outpost, coming in spring 2019.